It's Friday the 13th and we're going to celebrate Halloween tonight - why not! Anyway, while looking for zombie skin to compliment my dead-stewardess outfit, I stumbled across the JD Mechanical Toy Factory . My ears were accosted by the comforting sound of rusting cogs and puffs of steam. I was reminded of Bladerunner's J.F. Sebastian and his apartment full of toys when an automaton named Machine Person made flattering remarks while I browsed. Conceived by Jenne Dibou, there are some fantastic creations here - slouchy victorian cottages, rustic skyboxes, and for the ladies, a beautiful pair of pumps with gears spinning in the heels. Speaking of gears and beautiful detail - check out this set of steampunk neko ears and tail by Blackheart. 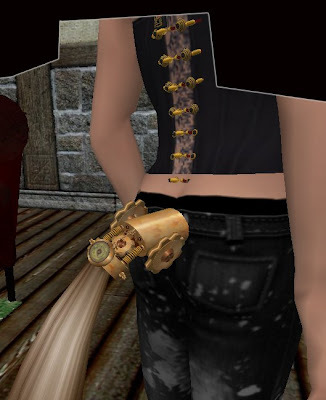 Being more inclined towards steampunk than neko I picked up this scripted tail and ears, for an extremely reasonable sum. Get your coppered arses down there!